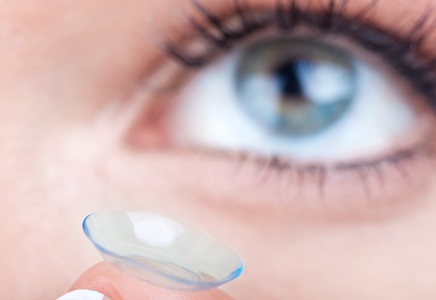 Soft contact lenses are one of the most popular choices for contact wearers. Made of a soft material, they conform to the shape of your eye making wear comfortable almost right away. With disposable contacts, you wear them during the day, remove them at night and then discard them at the end of the recommended timeframe. Non-disposable gas permeable lenses, or rigid gas permeable contact lenses, are made of a rigid plastic that retains its shape when you blink. The material type allows oxygen to easily pass through and provides the wearer with crisper vision. When you first start wearing rigid gas permeable contact lenses, it can take some time to adjust, but they are custom made for each person to provide long-term comfort. Corneal refractive therapy (CRT) lenses are used to gradually improve vision by changing the shape of your cornea. These specially designed lenses are possible with the use of gas permeable lenses that have been created not to fit your cornea’s existing shape, but to gently change your cornea’s shape, bringing the eye into correct focus. Unlike normal contacts, CRT lenses are usually only worn overnight. Contact Lens Initial Fitting: On the first day of your fitting, the contact lens technician will evaluate lens alignment and vision with trial contacts. The training process includes insertion and removal as well as learning to clean and care for your lenses. Contact Lens Refitting: We recommend a refitting every few years to take advantage of the latest technology. This visit is the same as your initial appointment, but at a reduced cost as less time is needed for patients that have had success with contact lenses and understand handling and care. You will be fit with new lenses while in the office and any necessary follow up appointments will be scheduled. Annual Contact Lens Evaluation: An annual contact lens evaluation is necessary to ensure continuing optimal fit and clear vision. Changes in lens powers, renewal of your contact lens prescription and your annual eye examination are the benefit of this appointment. Whether you’re considering your first pair of contacts or if it’s time for an updated prescription, our team is here to answer any questions and help you schedule an appointment. With a comprehensive eye exam, contact lens fitting and a walkthrough of proper care and wear, your vision will be clearer than ever before, so contact our office and schedule an appointment today!